Inspired by a Venezuelan woman who got an apartment after hitting Nicolas Maduro in the head with a mango, a game app was developed to replicate the fruitful beaning. The “Maduro Mango Attack” game, available since the end of April in the Google Play store, was created by two Venezuelans who moved to Argentina last year. Over 10,000 people have already downloaded it, attempting to virtually replicate the real deed of a lucky woman, who managed to catch the president’s attention in such an unusual way. Fernando Malave, one of the game's creators, told AP that the aim of the game is to “relieve some of the daily stress” with the help of humor, “which has always united Venezuelans”. In the game, a player has to throw mangos at the constantly moving leader in order to accumulate points. The game’s techno beat background is occasionally interrupted by encouragement from a prominent opposition leader. Special rewards go to those daredevils who attack National Assembly President Diosdado Cabello with a bag full of dollar bills. The reincarnation of the late President Hugo Chavez, represented by a small bird in a red beret, is also a participant. 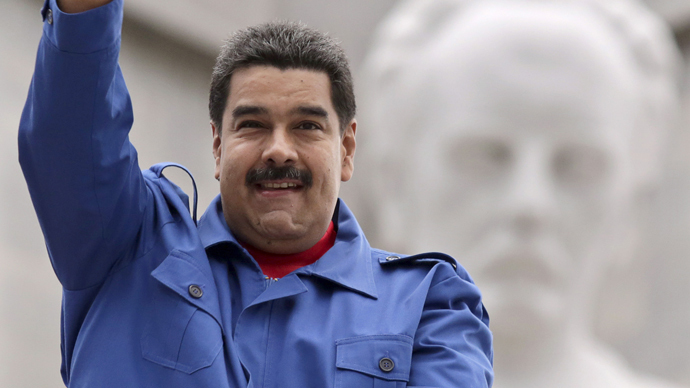 The bird is an allusion to a Nicolas Maduro’s revelation that Chavez had “tweeted” him to say he was glad about the way he was ruling the country – a few months after Chavez’s death in 2013. Last month, a mango did hit the head of the Venezuelan president while driving a bus through a crowd of supporters in the state of Aragua. A woman, who hurled a mango with her telephone number written on it, asked Maduro to help solve her housing problems. In the beginning, he actually welcomed the trend, joking that “it's the time of the mango,” thus encouraging his supporters to hand in their requests at an event in the city of Valencia. At the moment, Venezuela is going through an economic crisis with high inflation and unemployment rates, as well as shortages of basic goods.